These Guidelines were developed by the Canadian Society for Exercise Physiology (CSEP), the Healthy Active Living and Obesity Research Group (HALO) at the CHEO Research Institute, the Faculty of Physical Education and Recreation at the University of Alberta, the Public Health Agency of Canada, ParticipACTION and a group of leading researchers from Canada and around the world, with input from over 600 national and international stakeholders. To view the complete Canadian 24-Hour Movement Guidelines for the Early Years click here. 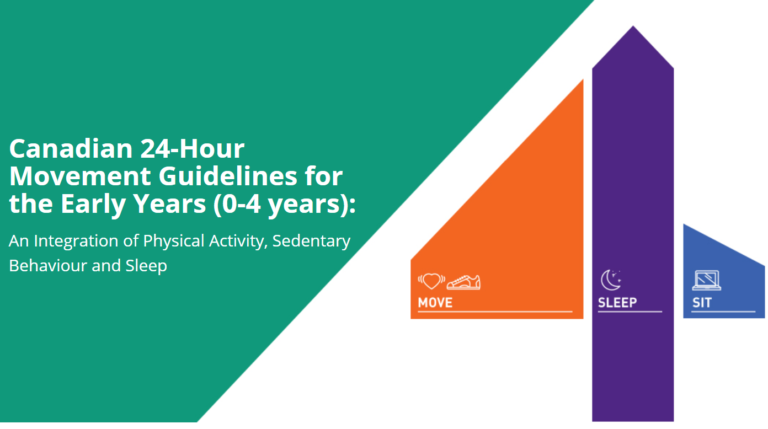 The Canadian 24-Hour Movement Guidelines1 for the Early Years combine physical activity, sedentary behaviour and sleep guidelines and show the interrelationship between all three behaviours using a 24-hour clock. The Guidelines are divided into infants (less than 1 year), toddlers (1-2 years) and preschoolers (3-4 years). According to the Guidelines for each group, a healthy 24 hours should include the following. Move: involve infants in physical activity throughout the day particularly through floor-based play. For those not yet mobile, include 30 minutes of tummy time spread throughout the day. Sleep (includes naps): 14 to 17 hours (infants aged 0-3 months); 12 to 16 hours (infants aged 4-11 months). Sit: do not restrain for more than 1 hour at a time (e.g. stroller or high chair); screen time is not recommended. Move: at least 180 minutes throughout the day. Sleep: 11 to 14 hours including naps, with consistent bedtimes and wake-up times. Sit: do not restrain or sit for more than 1 hour at a time (e.g. stroller or high chair); screen time is not recommended for children under 2; for those aged 2 years limit screen time to no more than 1 hour. Move: at least 180 minutes throughout the day of which 60 minutes is energetic play. Sleep: 10 to 13 hours including naps, with consistent bedtimes and wake-up times. Sit: do not restrain or sit for more than 1 hour at a time (e.g. stroller or high chair); limit screen time to no more than 1 hour. A series of fun videos to better understand the Guidelines has been developed for children aged 0 to 4,with separate videos for infants (less than 1 year), toddlers aged 1 to 2 years and preschoolers aged 3 to 4 years.